Fine of 2s and 18s 6d costs on Wednesday 12th August 1874 for being open for the sale of liquors at 11:20pm on the night of a gala. Harper believed his clock to be 15 minutes fast. Strangely, following the awarding of the fine, Harper was granted a one hour extension, apparently for the same occasion. Benjamin Rule, an employee of the Eastern Counties Railway entered the house, with companions Allen and Penman, at about midnight on Monday 2nd May 1859. He claimed that he had ordered an ale, but did not drink it. The next thing he knew was waking up at nine o'clock in the morning lying on the floor. All of his money (10s) had been taken, but his watch was safe in his pocket. When he had first arrived at the house it was very busy and a young woman, Frances Selby was standing near him. At the hearing Saturday 7th May, Mr. Rule accused Selby of using chloroform or some other stupefying drug to render him insensible. Police constable Rushlough said he had seen Rule sitting on the steps outside the house at about one o'clock. Rule appeared to be the worse for drink and in the company of two girls. He could not swear that Selby was one of them. Landlord Henry Shore said that he had served Rule with some spirits and water. As the house was being closed, Rule had been found quite insensible in the back yard. With the assistance of the waiter, Shore laid him in one of the back rooms. At the continuation of hearing on Wednesday 12th May 1859, Frances Selby was committed to trial. She complained of the hardship of being sent to prison for robbing a man she solemnly declared, she had never seen before. At the Norwich Quarter Sessions held Wednesday 13th July 1859 Benjamin Rule, a detective policeman in the employ of the Eastern Counties Railway Company was criticised for not appearing in court to give evidence against Frances Selby in the ` Alleged Hocussing Case'. It was a great offence committed by Rule against the magistrates not to appear and substantiate the serious charge he had made against Selby. It was a most suspicious case and considering the prosecutor's situation as a detective officer, it deserved investigation. The Recorder directed that all property found on Selby be returned to her and that she should be liberated at once. The prisoner was discharged. Licence of Lawrence Dawes objected to by the Magistrates at September 1851 Sessions. Reasons being that it was a disorderly house and dangerous to the neighbourhood from the practice of letting of rockets and other fireworks. The licence was renewed upon the news that Mr. Dawes was about to quit the house. Edward Chapman, for many years Coachman to R. H. Gurney, Esq., announced 8th November 1851 that he had taken the Inn. 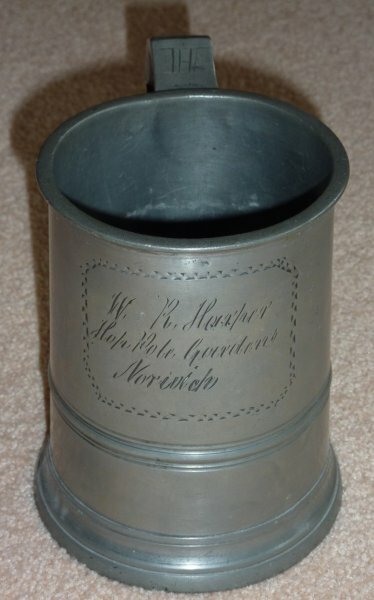 A quart mug bearing the name of W R Harper. Image thanks to Bill Atkins.